In 2017, there were 952 overdose deaths­­­ involving opioids in Missouri—a rate of 4.1 deaths per 100,000 persons and one-third the national rate of 14.6 deaths per 100,000 persons. 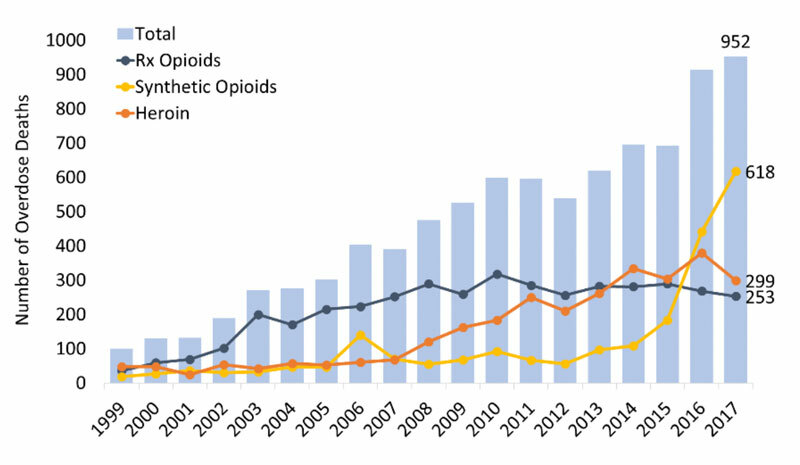 The greatest increase in opioid deaths occurred among cases involving synthetic opioids (mainly fentanyl), with an elevenfold increase from 56 deaths in 2012 to 618 in 2017 (Figure 1). Heroin involved deaths and those related to prescription opioids have remained steady in recent years. Figure 1. Number of overdose deaths involving opioids in Missouri, by opioid category. Source: CDC WONDER. In 2017, Missouri providers wrote 71.8 opioid prescriptions for every 100 persons (Figure 2) compared to the average U.S. rate of 58.7 prescriptions for every 100 persons. Overall, this represents a less than 10 percent decline in Missouri opioid prescriptions since 2006 (CDC). 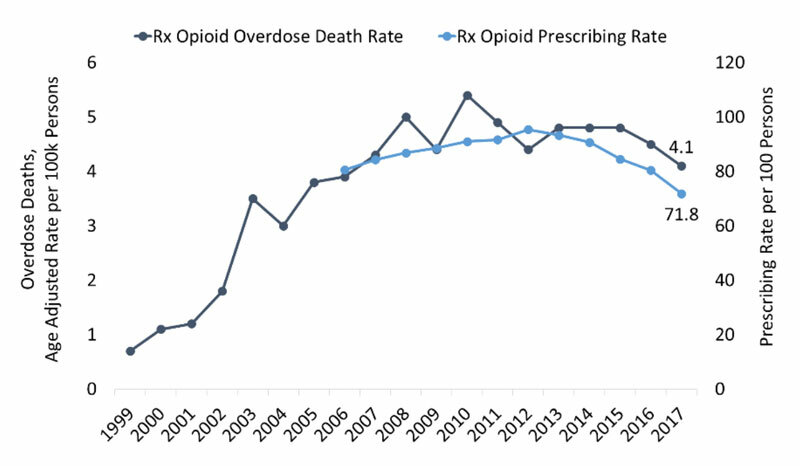 The rate of overdose deaths involving opioid prescriptions has followed this trend with overall rates unchanged in the last decade: 4.3 to 4.1 from 2007 to 2017(Figure 2). Figure 2. Missouri rate of overdose deaths involving prescriptions opioids and the opioid prescribing rate. Source: CDC and CDC WONDER. 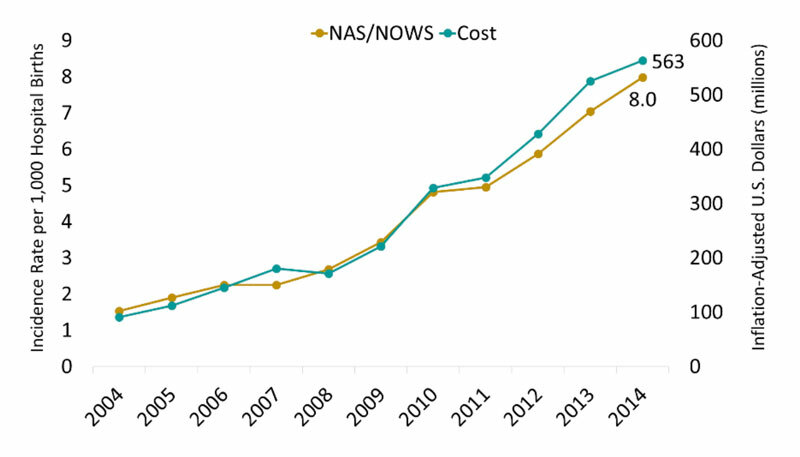 In 2016, there were 2,112 reported cases of NAS/NOWS in Missouri (Missouri Department of Health and Senior Services). Figure 4. Missouri: Estimated percent of male vs. female with new HIV diagnoses, by transmission category, 2016. Source: CDC and www.AIDSVU.org. State Incidence: Of the new HIV cases in 2016, 511 occurred in Missouri. Among males, 6.6 percent of new HIV cases were attributed to IDU or male-to-male contact and IDU. 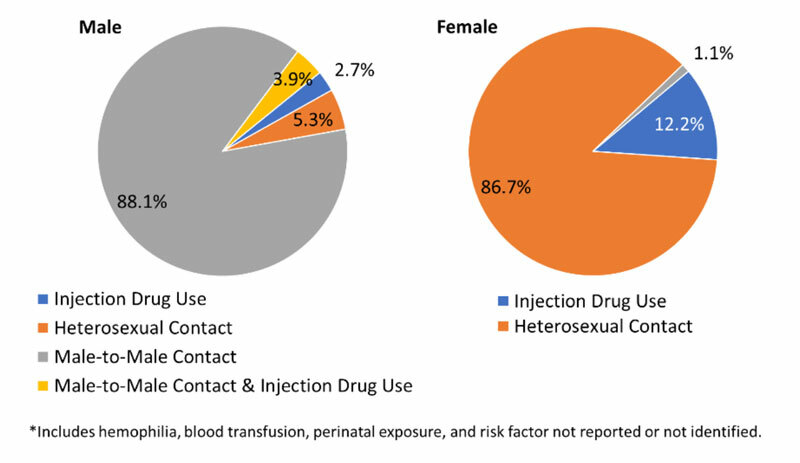 Among females, 12.2 percent of new HIV cases were attributed to IDU (Figure 4) (AIDSVu). State Prevalence: In 2015, an estimated 11,887 persons were living with a diagnosed HIV infection in Missouri—a rate of 234 cases per 100,000 persons. Of those, 13.4 percent of male cases were attributed to IDU or male-to-male contact and IDU. Among females, 16.3 percent were living with HIV attributed to IDU (AIDSVu). State Incidence: There were approximately 24 new cases of acute HCV (0.4 per 100,000 persons) reported in Missouri in 2016 (CDC). State Prevalence: In Missouri, there are an estimated 41,000 persons living with Hepatitis C (2013-2016 annual average), a rate of 880 cases per 100,000 persons (HepVu).